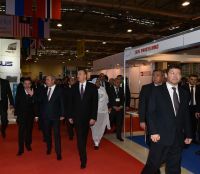 President of the Republic of Azerbaijan Ilham Aliyev has reviewed “BakuTel-2014” 20th Azerbaijan International Telecommunications and Information Technologies Exhibition. Minister of Communications and High Technologies Ali Abbasov informed the head of state of the exhibition. It was said that apart from local companies, this year`s exhibition brings together 250 companies from 23 countries. They include leading information and communication technologies companies, Azerbaijani mobile operators, internet providers, system integrators and famous brand distributors. The head of state reviewed national and foreign pavilions. President Ilham Aliyev was interviewed by Euronews channel. The President of Azerbaijan wished the participants of the exhibition success.